A normal way to troubleshoot ground loops problems in audio systems is to listen to the audio signal at the mixer with headphones. If the buzz exists at the mixer then do the following: One by one, disconnect the inputs and outputs to and from the mixer and note if the buzz decreases. This same connecting and disconnecting wires method can be used on other components of audio and video systems. Disconnecting and then reconnecting the cables take a lot of work. This caused that ground loops are frustrating to troubleshoot in large systems where there are lots of cables. I have found that a clamp type multimeter can help to troubleshoot ground loop problems. The ground loop noise is normally caused by the extra noise current flowing on the shields and ground wires of the cables. That noise current is normally mains voltage frequency (50 Hz / 60Hz) or it’s harmonics. Normally the signal cables should not carry any (or very little) mains frequency current in them, so by measuring this kind of current flowing on the cable it is possible to determine where the noise current flows. A clamp type multimeter is a very good tool for doing the measurements, because you can easily measure the noise current flowing on the cable with it without need to disconnect the cable or disturb the signal inside the cable. This means that you can troubleshoot a live system with clamp multimeter in AC range. The wires which have considerable current on them are part of ground loop. The wires with most current on them are pushing most noise current to the whole system. So first locate the wires that have highest or otherwise very high current flowing in them. Then you can try to disconnect them and test if that stops the noise. Usually there is one or few cables that cause all or most ground loop current on the system. That noise current gets typically flowing around in different cables on the system, causing more or less noise problem here and there around the system. Then the real noise source or sources are disconnected, suddenly the whole system becomes noise free. When you have found out the problem source then just add suitable cure to that connection (typically signal isolation transformer or similar device). Clamp on multimeter allows you to easily measure the current on cables. Just clamp the meter over the audio cable and get the AC current reading. If you want you can clamp several audio/video cables inside the clamp and get the reading of the sum of their noise currents (remember that there is possibility that if there are two cables with exactly same noise signal but different direction you get zero reading). Clamping the meter around a number of signal cables speeds up the troubleshooting process where there are lots of cables, for example near audio mixer. If the group of cables you measured with clamp meter shows a considerable noise current, then measure the cables individually to see which one has the most current flowing. If there was no considerable current on the cable group, continue measuring next cable group. Besides audio cables you can do the measurement with video cables, mains power cables and other signal cables. There are few things to consider the selection of the clamp type multimeter. First the multimeter needs to measure the AC currents with the clamp. 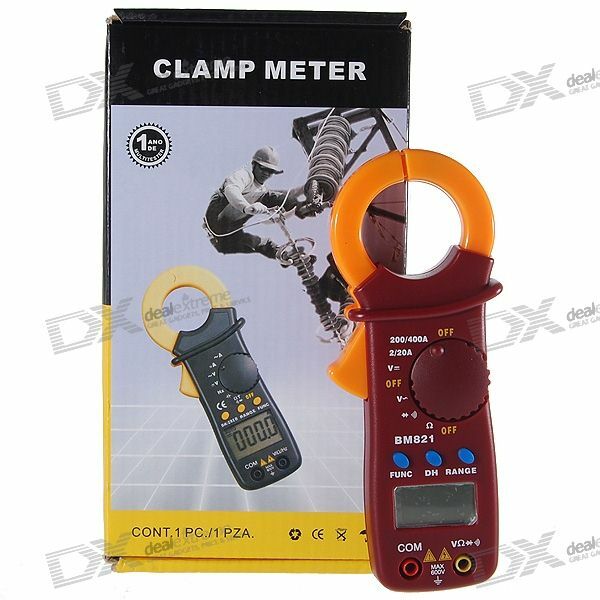 You don’t need the DC current measuring capability, although getting a clamp meter with also DC capability can make the meter more useful for other applications (usually the DC capable clamp meters are more expensive than AC only). The second thing to consider is the resolution of the meter. The ground loop currents you normally want to measure are in few mA to 1A range (in some severe case the current can be considerably more). It is preferred to have a clamp meter that can measure currents down to few mA. Unfortunately many meters with this good resolution are usually quite expensive. Usually the cheap clamp type multimeters have 10 mA or 100 mA resolution, meaning that they can’t detect anything lower than 10 mA or 100 mA. A multimeter with 100 mA resolution is practically useless in ground loop problem solving, because over 100 mA ground loop current are not seen often. A multimeter with 10 mA resolution is already useful to troubleshoot ground loop problems, but it will not reveal you all the details in most cases. Usually 100 mA-1A current on cable means very serious noise problem on audio and video systems, currents in 10-100 mA range cause some noise problems. Usually when the current is well below 10 mA there are no considerable noise problems. I have used a clamp meter with 10 mA successfully for troubleshooting ground loop problems, but when used that I wished I had a meter that can show even lower currents down to 1 mA or less. So if you are buying a clamp meter, consider trying to get as good resolution as possible with the money you are willing to spend it. When looking for multimeter for this application the actual measuring accuracy (measurement error percents promised) is not important, we are merely making checks if there is current flowing or not and approximately how much (just some approximation around how much current is enough). This picture shows the cheapest I know well working clamp multimeter that can measure currents AC down to few mA currents. The meter has 1 mA resolution at 2A measurement range (the display started showing current higher than 2 mA). You can get this 1.3″ LCD Clamp Style Digital Multimeter with Pouch from Dealextreme for around 20 US dollars. Handy testing equipment is a good tool for troubleshooting electrical malfunctions. You don’t need an assistant to handle portable testing equipment. I found your blog on Tuesday via Google while searching for video loops and your post regarding Troubleshoot ground loops with clamp multimeter « Tomi Engdahl’s ePanorama blog seemed interesting. I have a few websites of my own and I must say that your site is really top notch. Keep up the great work on a really high class resource. I was very pleased to find this site.I wanted to thank you recompense this great read!! I definitely enjoying every mini bit of it and I obtain you bookmarked to check in sight uncharted things you post. I’m just surfing the internet and I arrived throughout this web page. I truly liked the information, hold up the excellent perform. This is a usefull post. I just couldnt leave your website just before saying that i genuinely enjoyed the excellent info you offer for your site visitors..
. Will probably be back often to verify up on new things you article! Novelists should never allow themselves to weary of the study of real life. I am pleased that I detected this blog , exactly the right information that I was searching for! . Heya i’m for the primary time here. I found this board and I find It really useful & it helped me out a lot. I’m hoping to offer something again and help others like you helped me. Just excellent writeup. Them actually had been a new leisure account that. Glimpse difficult to considerably released reasonable by you! Having said that, how can we communicate? when do you really need a plumbing service? The Fluke 368 FC and 369 FC leakage-current clamps help technicians identify, document, record, and compare readings over time to prevent problems before they happen. These rugged meters have large diameter jaws—40 mm for the 368 FC and 61 mm for the 369 FC—and capture leakage-current signals as low as 10 µA. The clamp’s jaw is fully shielded to minimize external electromagnetic interference. The Fluke 368 FC true-rms leakage current clamp meter helps you measure small problems before they become large problems, all without taking equipment off line. Normal earth ground measurement involves disconnecting parallel grounding rods, “planting” several auxiliary grounding stakes, and using a earth ground tester to calculate the resistance of grounding system electrodes. Sometimes, though, there isn’t anywhere to plant the grounding stakes—such as inside a building, at a cell phone substation, or on power pylons. What then? With the Stakeless testing method, earth ground stakes aren’t necessary. Place an earth ground clamp like the Fluke 1630 around the earth ground rod or the connecting cable. One half of the clamp will induce a known voltage while the other half measures current. The tester automatically determines the ground loop resistance at this grounding connection. You can also conduct continuity testing, leakage current measurement, and lighting protection system inspections much the same way, also without breaking the circuit. Is NOISE getting to you? Don’t let it slow you down. The Megger DET14C/24C clamp-on ground testers help identify noise problems that CATV companies have when introducing DOCSIS3.1. Let us show you how to use the unit to mitigate noise troubles caused by increased bandwidth. Megger’s DET24C clamp-on ground tester helps identify noise problems that CATV companies have when introducing DOCSIS3.1. • It allows easy measurement of grounds. determine the degreeto which they’re balanced. Fluke 1630 Earth Ground Clamp, a rugged clamp meter with a wide 35 mm jaw opening that offers time-saving ‘stakeless’ earth ground loop resistance and non-intrusive ground leakage current measurement for electrical contractors, field service, industrial maintenance and utility technicians. The Fluke 1630 Earth Ground Clamp is placed around the earth ground rod or the connecting cable. A known voltage is induced by one half of the clamp and the current is measured by the other half. The tester automatically determines the ground loop resistance at this grounding connection. Maybe some day I open a twitter account. You can’t download this theme anywhere. It is custom made for this site. You are using similar design on your site, but not exactly the same. The blog on this site used to run earlier a bit slowly, but moving the site to more powerful server did wonders. Earlier the poor MySQL performance was the slowing factor, now the database server is powerful enough so things run smoothly.